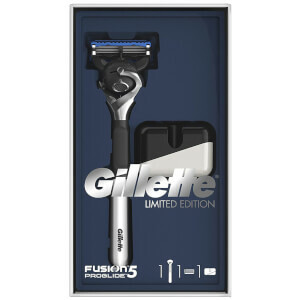 The Gillette Mach3 Limited Edition Gift Box has a sleek design and a razor stand for an elevated shaving experience. Inside, you'll find a limited edition Mach3 chrome handle razor and razor stand. The Limited Edition Mach3 razor fits all Mach3 blade refills. Give him the best gift a man can get with the Gillette Limited Edition Mach3 Gift Box.